I bought the wrong chicken. Because I went to a big bulk store, I bought a lot of the wrong chicken. I blame tenderloins because they look like chicken breasts. Hmm? Look at the label you say? So I needed to return it quickly. I grabbed it, grabbed my keys and bolted out the door. And landed face front on the front step. Actually I fell into a bush first. And then I landed on the front step. My keys and my package of wrong chicken landed around me. If a vegetarian falls with some chicken did a vegetarian really fall at all? So there I was. On the ground. Yelping for help. Did I trip? Did I miss a step? No idea. I just went down like a big old elm. Timber! You do turn an oven on. 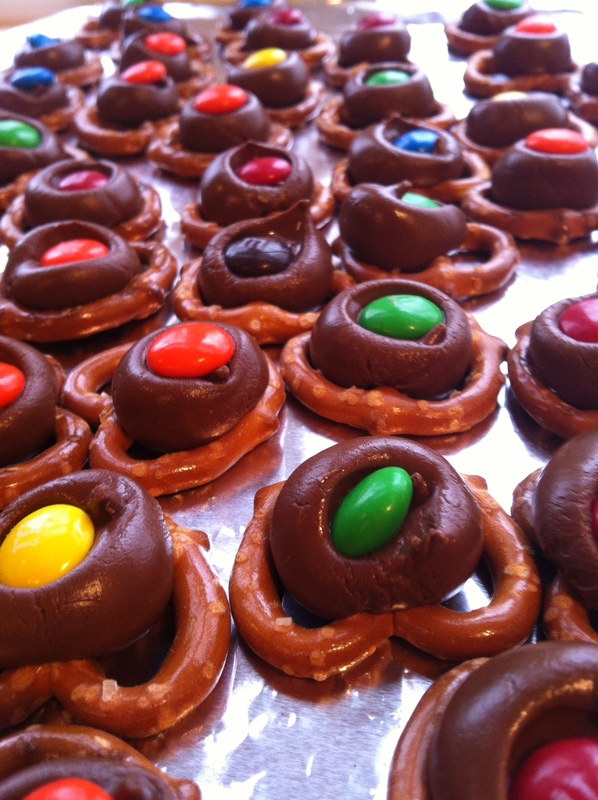 Our wonderful neighbors make this every year and I promptly stole the recipe. Actually it’s more of a trick than a recipe. But it’s so good and it’s so easy. 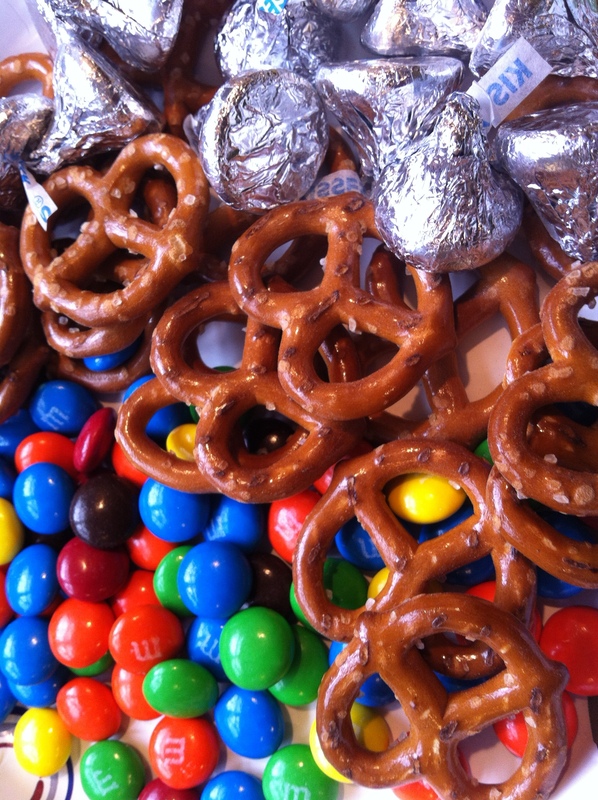 Small pretzels, Hershey kisses, and M&Ms. Preheat your oven to 175. See, told you it was baking. 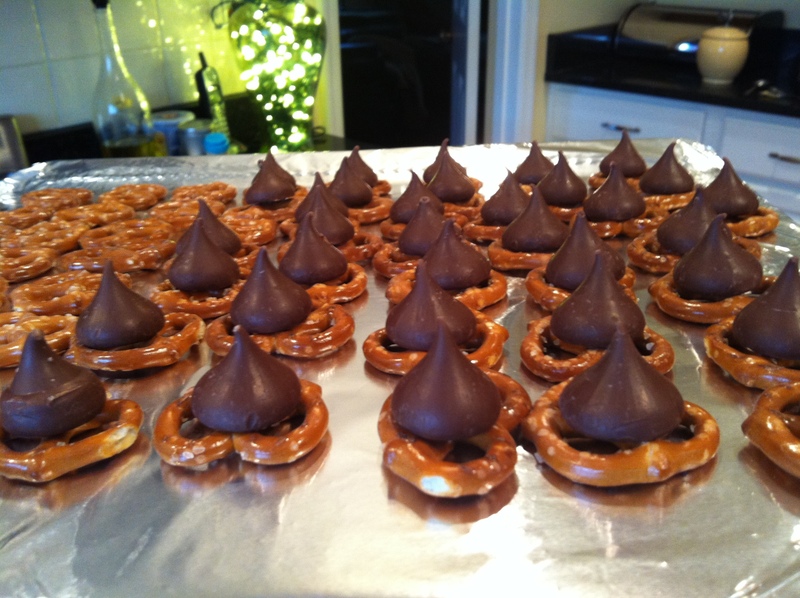 Then spread your pretzels out on a sheet and put a kiss on top. Bake for 4 minutes and take out. Add an M&M and smush down. Smushing is a technical baking term. Let them cool and done! Trust me, your people will be happy. Your people will love you. More. Finally. 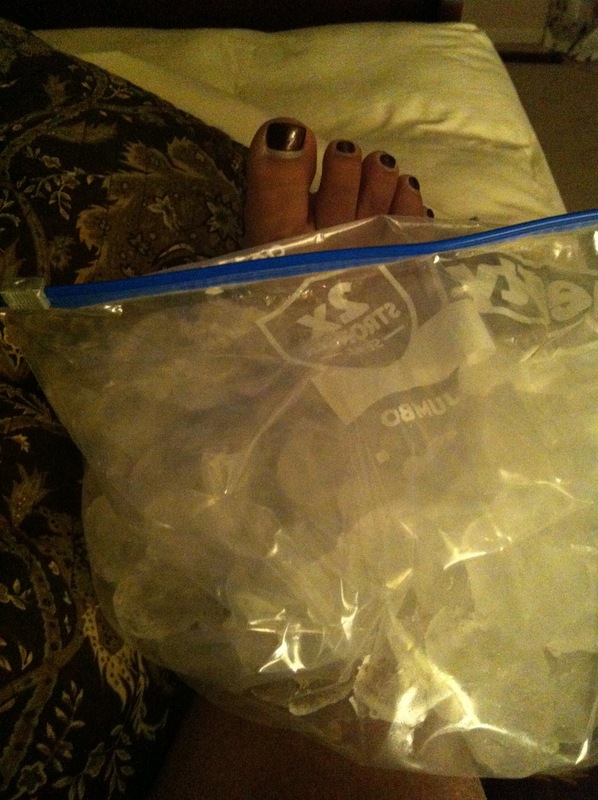 Things that make you go….f**##%@! Not a post. Just a thought. Unless a store runs out of gifts (aka merchandise) – they should not run out of gift boxes. To all those stores who try to “sell” me a box….for shame. FOR SHAME!!! On Not Being a Grownup at Christmas – GUEST POST! A big thank you to my little bitty sister for this great post! And look at those jazzy handmade stockings. Show off. In our family, Christmas is about the presents. Once I explain, you’ll realize that that wasn’t the saddest sentence ever to grace this blog. Our family – cousins, aunts, uncles, significant others – gets together all the time. We celebrate every little thing with a big family get-together, and for the most part, it’s great (tis the season to overlook the drama). American holidays, Indian holidays, Hindu holidays, Christian holidays: it’s all fair game. Next year there’s even talk of getting a menorah (we’re equal opportunity around here). And there’s always food, fun, and more food. But it’s not just the stuff. It’s the entire experience. I love opening presents. I love that we all move away from the TV and sit around the tree. I love the anticipation of finding out what’s under the wrapping, and heck, I love the wrapping too. I spend way too much time thinking about how I wrap my presents, and I like giving my family the presents I’ve spent my time making beautiful. During this conversation at work, another colleague recommended that my boyfriend and I get something for our apartment – a shared gift. He and I had considered this option, but we decided it was far too grown up for us. We wanted the presents, however small and inexpensive, but full of thoughtfulness and love. Except I’m doing the opposite of saving the world. I’m just doing conference calls, and meetings, and yelling about homework, and yelling about cleaning. Know what I’m not doing? Working out. Volunteering. Blogging. Cuddling with my babies and watching Christmas movies (not that those giants want me to cuddle with them but you get the point). Hope you are doing well in your worlds. Hope you are enjoying the season. The rainy, humid, foggy, season. My family is a bunch of YouTube junkies. They are constantly looking at videos for the following: how to beat levels on Lego Batman, do a perfect waterfall braid, put in a new sink fixture, learn how to play “Dominic the Donkey” on piano, how to tell if you have termites etc. Once in a while, they’ll show me a video that they think I’ll like. Flash mobs are a favorite of mine, as are crazy wedding dances and proposals. Basically anything that involves music and a group dance-off – which I’m all about. This week I found something on YouTube that they hadn’t seen. It’s been all over the morning shows – I’m probably late to this party – but I wanted to share. There’s a prank show in Brazil that only does elevator gags. I’ve seen the other ones, which are funny, but not as mental and deranged as this one (I like my humor spiked with mental and deranged sometimes, sue me). I also knew it was a winner when it reduced my husband to a puddle of laughter. For extreme clarification, my 14-year-old would like to point out that she had already seen this video and that I didn’t introduce anything new to her. Ah hem. Every year, for the past 5 years, we’ve been invited by a favorite aunt to the middle of Amish Country for a Christmas get together. It’s hokey, it’s cheesy, it’s exactly what you need to kick off the holiday season. It’s like a mini reunion in December – and it’s perfect. Here’s the cast of characters this year – as you can tell by our faces, a good time was had by all! Sometimes you laugh, sometimes you get laughed at – that’s what our family is all about! That’s our cousin Dennis over to the right, there will be a whole post about him and his amazing momma. Jazzy xmas sweater Den! We also put our tree up – inspired by everyone else’s beautiful trees on Facebook. I know loads of people don’t like FB, they think it’s evil, and it might be. But where else can you see everyone’s Christmas tree? Or everyone’s turkey? Or everyone’s summer vacation pics? For a nosey rosie like me, it’s perfect. What were talking about? Christmas trees. They are all beautiful. Every single one. Fake, real, tall, short, it doesn’t matter. And every ornament tells a little story (even if the story is that you walked into Pier One and got it for 60% off). Here’s some ornaments from our tree and the stories that go with it. Almost 10 years ago, our very dear friends gave us this beautiful wooden angel that they picked up in Italy. It’s one piece of wood, hand carved and I wish my pictures could do it justice. I’m obsessed with the little feet, and the little toes. Don’t judge. This ornament was waiting in our mailbox when we moved into our very first home. It was the week after Christmas and we didn’t even have a tree that year, but we kept the ornament hanging in the kitchen until March. It’s no coincidence that it’s from the same favorite aunt that organizes the get togethers every year. And ofcourse we have some handmade ornaments on the tree – this one was made by my burly husband when he was a little wee tot. I asked him where he made it and how and why and what was his most precious memory of this ornament but all I got was,” I have to run to Home Depot”. This little ornament breaks my heart every time we put it on the tree. I worked right down the road from the World Trade Centers, where they’d have a holiday fair every year, I’d go but never really buy anything – except this little ornament. Two years ago, my husband and I were in the living room watching TV (shocker!) and as if in slow motion, we saw our entire tree come crashing down. We both tried to save it, but it was too late. It was like a an ornament crime scene. Broken glass and cracked ceramic everywhere. Sad right? Thought you should know. So here’s the tree in its glory. We still believe in Santa in this house so there aren’t any gifts under the tree until Christmas morning (which also gives me until Christmas Eve to run around like a lunatic and buy presents). Hope you are all getting into the spirit of whatever holiday you celebrate or don’t celebrate.